E arthmill Maintenance are committed to looking after you and your turbine throughout its operational lifetime. We manage a fleet of over 300 turbines many of which are owned by us, giving our customers confidence that we will be here to care for their turbines for many years to come. As wind turbine owners, we understand that regular servicing is essential to keep your technology in good working order and operating efficiently in order to maximise your return on investment. That’s why our dedicated team of engineers have undergone specialist training in order to perform advanced works such as blade swaps, expander pin replacement, shaft upgrades and laser alignment. We have recently released a series of upgrades for the Endurance E-Series turbine which you can read about by clicking here. Earthmill Maintenance have recently swapped their entire fleet of turbines from the outdated monitoring platform ERIC to the new purpose built Wind Sync software. Despite its significantly smaller price tag, the new software is proving to be a great success with increased response times, better connectivity and improved turbine performance. The new software prompts turbines to automatically notify the Earthmill Maintenance techsupport team of a shut down in order to get to work on resolving a problem straight away. Wind Sync allows the operations team to work on remote fixes to problems that would previously have required an engineer site visit. This better level of control results in resolving alarms and faults faster and drives down our clients operational costs whilst increasing uptime. Wind Sync also provides a more in-depth analysis of performance and historical data to show how well a turbine is working, allowing us to see where a turbine can be fine-tuned to improve performance for example we can now adjust parameters so that the turbine does not shut down in safe high winds, extending the operational power curve. New and exclusive to Earthmill Maintenance customers, Condition Monitoring comprises of a number of sensors around the turbine nacelle. The sensors measure a series of data points to identify any irregularities that if not addressed, could lead to issues such as spring tube failure, hub slip, bed plate cracks and gearbox or drive coupling failure. Put simply, Condition Monitoring flags the symptoms of serious failures before they can occur, meaning we can address the issue before it results in major mechanical breakdown and costly repairs. Since the collapse of turbine manufacturer Endurance, we have invested over £1m into spare stock . Our huge array of spares which include large items such as complete blade sets, generators and gearboxes as well as consumable items allows us to carry out faster repairs, ultimately increasing your turbines availability for generation. Due to the breadth and density of our fleet across the UK, there is nearly always an engineer on hand in your area. We don’t like to keep customers waiting however and so may call upon a local maintenance specialist from our list of trusted suppliers from time to time in order to maximise your technology’s availability for generation. From time to time your renewable technology is going to need unplanned maintenance. It’s absolutely key that your maintenance team are able to respond quickly as every hour spent out of action is another hour you’re not generating power and income. We monitor our entire fleet live from our head office, so we can see immediately if your turbine goes offline. We can then try a remote restart or dispatch an engineer. Our team of engineers all carry vehicle trackers, so in the event that a remote restart is unsuccessful we can see which engineer is closest to you and direct them straight to your site. Finally, we operate an out of hours emergency email service, so you can always reach us if you need to. Don’t just take our word for it, our track record speaks for itself; the industry average for turbine availability is 95%. Earthmill are proud to maintain an average of 98% which is worth up to £1,200 in additional income per turbine each year. Servicing quality is key in keeping your renewable technology running as efficiently as possible. Your company of choice should use quality approved parts and engineers should be fully trained and certified to do the job. Earthmill Maintenance operate a team of dedicated, fully certified engineers, with over 65 years of industry experience. Our policy of continuous training and our excellent working relationship with suppliers mean that we are always at the forefront of best practice when it comes to keeping your renewable technology running reliably. After this we offer a Pay-As-You-Go maintenance package for all scheduled servicing, parts and consumables and any additional unscheduled visits required so you only pay as and when work is required. 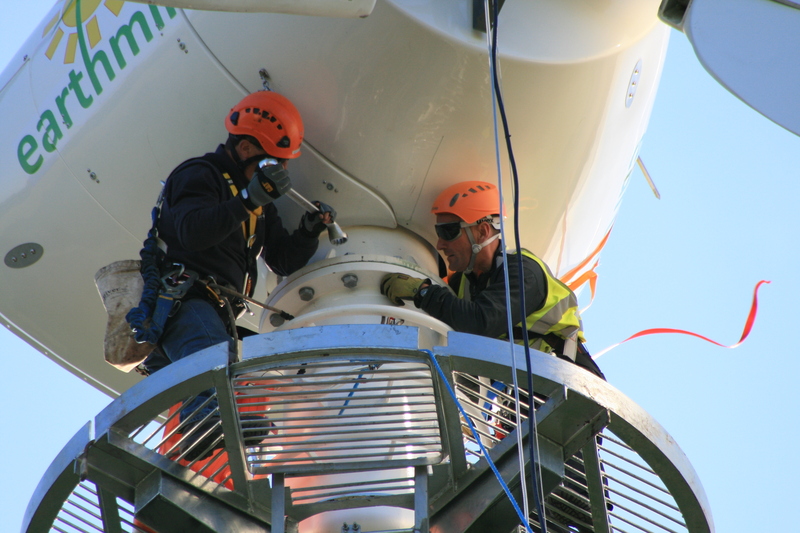 Our service and maintenance packages cover most 50 to 500kW turbine models. For more information about our servicing and maintenance packages please contact us directly on 01937 581011 or request a desktop site assessment online.